BUENOS AIRES, Apr 20 2018 (IPS) - As president this year of the Group of 20 (G20) developed and emerging nations, Argentina has now formally begun the task of trying to rebuild a consensus around climate change. It will be an uphill climb, since the position taken by the United States in 2017 led to a noisy failure in the group with regard to the issue. 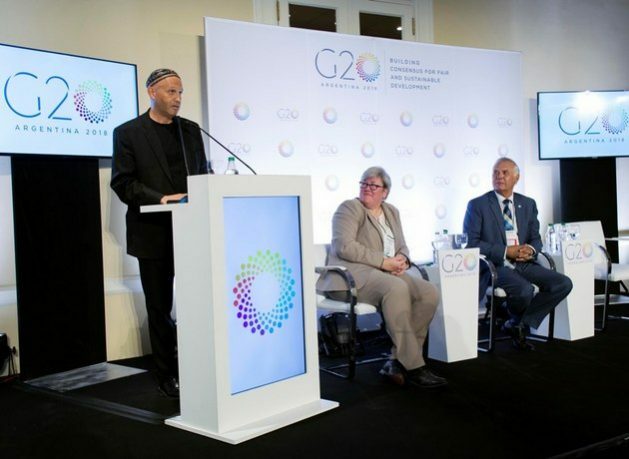 The G20 Sustainability Working Group (CSWG) held its first meeting of the year on Apr. 17-18 in Buenos Aires, in the middle of a balancing act. Argentine officials hope a full consensus will be reached, in order to avoid a repeat of what happened in 2017 in Germany, when the final document crudely exposed the differences between the U.S. standpoint and the views of the other 19 members, with respect to climate change. “Since the United States does not recognise the Climate Action Plan agreed in Hamburg (where the last G20 summit was held), we did not formally table it. But what we are doing is addressing the contents of that plan,” Carlos Gentile, chair of the G20 Sustainability Working Group, told IPS. “Today the United States is participating and we are confident that this time a consensus will be reached for the G20 document by the end of this year,” added Gentile, who is Argentina’s secretary of climate change and sustainable development. The official stressed, as a step forward for the countries of Latin America and other emerging economies, the fact that the main theme of the Working Group this year is adaptation to climate change and extreme climate events, with a focus on development of resilient infrastructure and job creation. “We know that mitigation is more important for the developed countries, which is why it is a victory that they accepted our focus on adaptation,” said Gentile. The Working Group commissioned four documents that will be discussed at the end of August at the second and last meeting of the year, which will be held in Puerto Iguazú, on the triple border between Argentina, Brazil and Paraguay. Two of the papers will be on adaptation to climate change and will be produced by the Organisation for Economic Cooperation and Development (OECD) and UN Environment. The other two will be about long-term strategies, prepared by the World Resources Institute, an international research organisation, and how to align funding with the national contributions established in the Paris Agreement on climate change, by the International Labour Organisation (ILO). One of the highlights of the two days in Buenos Aires was that the countries that have already finalised documents on their long-term strategies (LTS) shared their experiences. Among these countries are Germany, Canada, the United States, Great Britain, Mexico and France. The LTS are voluntary plans that nations have been invited to present, by the Conference of the Parties (COP) to the United Nations Convention on Climate Change, about their vision of how it is possible to transform their productive and energy mix by 2050 and beyond. While the national contributions included in the Paris Agreement, established at COP 21 in December 2015, are included in the 2030 Agenda for Sustainable Development and are to be reviewed every five years, the LTS look much further. “Each of the countries designed their LTS in their own way. Some countries said they used it as a way to send a signal to the private sector about what kinds of technologies are foreseen for the climate transition and others spoke about job creation,” said Lucas Black, climate change specialist for the United Nations Development Programme (UNDP). The UNDP collaborates with the Global Resources Institute in its document on the LTS and it also plays a role in the agenda of issues related to the development of the G20, as an external guest. What does not seem clear is where such ambitious transformation plans towards 2050 will find the resources needed to turn them into reality. In this respect, Black acknowledged to a small group of journalists that for emerging economies it is particularly difficult to find the funds necessary for carrying out in-depth changes. “The private sector, particularly in infrastructure, really needs long-term certainty. That is a crucial part of its decision to invest,” said the international official, who arrived from New York for the meeting. This year’s G20 Leaders’ Summit will take place Nov. 30-Dec. 1 in Buenos Aires and will bring together the world’s most powerful heads of state and government for the first time in South America. By that time, which will mark the end of the presidency of Argentina, this country hopes to reach a consensus on climate change, an issue that was first addressed in the official G20 declaration in 2008. Black believes it is possible. “Obviously, the G20 countries have different views. During the German presidency there was no consensus on all points. But all G20 members have a strong interest in the issues discussed this week: adaptation to climate change and infrastructure, long-term strategies and the need to align financing with national contributions,” he said. The Working Group meeting in Buenos Aires was opened by two ministers of the government of President Mauricio Macri: Environment Minister Sergio Bergman and Energy and Mining Minister Juan José Aranguren. Before joining the government, Aranguren was for years CEO of the Anglo-Dutch oil giant Shell in Argentina. Argentina launched a programme to build sources of generation of renewable energy, which is almost non-existent in the country’s electricity mix but drives the most important projects in other areas of the energy sector. Thus, for example, it was announced that in May Aranguren will travel to Houston, the capital of the U.S. oil industry, in search of investors to boost the development of Vaca Muerta, a gigantic reservoir of unconventional fossil fuels in the south of the country. The minister has also been questioned by environmental sectors for his support for the construction of a gigantic dam in Patagonia and the installation of two new nuclear power plants. “Latin America has a series of opportunities to build a more sustainable energy system, to improve infrastructure and to provide safe access to energy for the entire population,” Aranguren said in his opening speech at the Working Group meeting.